This is the travel size. Love it so so much that I need it while I am travelling. Let’s get real here. If you are Indian/Brown like me then chances of you being hairy is inevitable. This post is solely dedicated to my hairy girlfriends out there. I hear you lovelies. Now if you aren’t hairy(I am super jelly of you) then this post isn’t for you so go choo and check out my some other blog #justkidding. 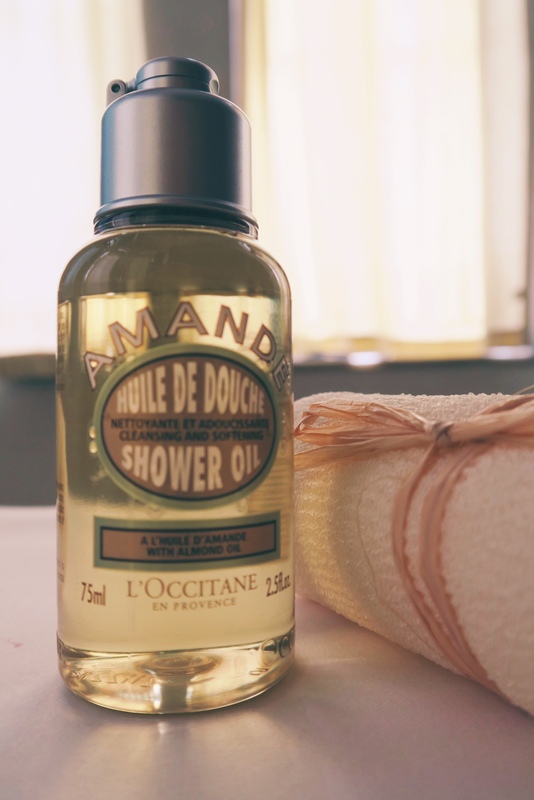 I would be reviewing this amazing L’Occitane Almond Shower Oil. Its L’Occitane’s bestseller, winner of Beauty Bible Awards and Marie Clarie’s Choice. So lets begin. It’s been 3 years now that I have been a religious user of the Shower Oil. I use it mainly for shaving and sometimes just for shower. If you are a user of shower gels, it’s very similar to that. This is the simple way of using it. But there are other ways you can use it too. Before you are going to take a shower, you can massage it first, like oil onto your skin and then add water and make it turn into a milky/soapy consistency. Or if you want to shave which is what I use it for.You would have to wet your body and apply it onto your skin. Then shave with your razor and it will glide like a dream without leaving any residue onto the razor. I dislike those products which leave residue on the razor and make the blade blunt and useless for shaving. This doesn’t do that. What’s the difference between a shaving cream and this shower oil? The difference is that this a 3-in-1 product. And for lazy gals its perfect when you forget to buy that shaving cream. It does the job for both. It’s mostly made with natural ingredients (enriched with almond oil) unlike the shaving creams you get to buy in the market full of chemicals. For someone who hates waxing and using shaving creams (which irritates my skin) I love using this product. If shaving creams give that burn/irritation while using it then this one is for you. It gives a luxurious spa like feel than shaving creams. Bonus points for that close shave it gives you just like shaving creams. Yes, it has a mild sweet almond smell which isn’t overpowering at all. I quite like it. I am really not good at describing smell. Not my forte. Sorry. Does it leave the skin dry? No, it doesn’t. It’s very moisturizing even after using as a shaving agent. As a person who has an extremely dry body skin this product doesn’t dry out my skin. I wouldn’t say that I don’t need a body cream after using it. During summers I can get away without using any body lotion, but in winter because of my lizard like skin I require extra TLC. The 250 ml lasts for more than 3 months. I shave every other day. INR (1690) & £16 (UK) for 250ml. It may seem a lot of for a shower oil/gel. But remember, it lasts really long and you don’t need to use a lot each time you shower. It’s also a 3-in-1 product. Its has Almond oil in it and they are expensive. There’s always some kind of offer going on in L’Occitane, which can save you some bucks. So give yourself a little treat and get it. You know you deserve it. And thank me later. All in all it’s a must have in my shower kit. There’s a 5*****. It’s on my next shopping list! Am so gonna get this! !